Very good and interesting post Ian! This was certainly true for the organization we both worked for in the past. Changes were so frequent and fast paced that people were unable to close & mourn the previous changes before the new ones hit them already. I think there were “several realities” of the current state in the organization and different parts of the organization were in fact still living in the older setup therefore unable to adapt & cope with the upcoming one. Explanations, reasoning, benefits of the upcoming change were so bizarre or abstract because people were so far behind the executives in intepreting the chaotic situation. As we have more history behind us, it is difficult to let go of our past and live in the present. It is only when we have accepted the past, can we truly embrace and transition to the present. In my experience, it is exciting to try new initiatives, but sustaining these and getting commitment is always a challenge. Possibly, this because there is so much unresolved baggage left from previous interventions – I have seen a situation of one restructuring after the other with little or no positive affect – before people have had time to assimilate and settle down, here it comes again ! In our need for action and movement, we hasten the process and forget to give enough time for grief and acceptance. Just as in our personal lives, employees too need support and recognition to gain strength to move on to the next stage of growth. This really resonates with me in a couple of ways. Firstly – even if we work with the original Kubler-Ross model we rarely give sufficient acknowledgement to the grieving stage. I remember talking to an OD practitioner many years ago who was working on the closure of the nuclear reactors in Harwell near Oxford. Aside from its importance to the local economy as an employer, and whatever our own views are about nuclear power, he told me how proud people were to be part of this world leading and ground breaking organisation. They were devastated about its closure. To help the staff cope with their own ‘closure’ he persuaded the organisation to organise a ‘wake’. A party on site to celebrate the good times, tell their stories, shed a few tears. How much better does that sound than a few dry sandwiches and a five minute speech full of platitudes from the Chief Exec? My other point relates to a someone I was working with as a mentor. This person’s stress had led to a mild depressive illness for which he was being prescribed medication. He told me that his doctor had explained to him something about the physiology and finely balanced chemistry of the brain which had helped him to understand what was happening to him. Essentially he said, the level of stress caused by constant waves of change and personal uncertainty at work had used up the chemicals that his brain needs to cope and feel positive faster than his ability to produce it. Once that tipping point is produced the negative feelings start to dominate and the brain produces less of the feel good chemicals that we need. This is a vicious circle which can have an exponential effect. I don’t vouch for the detailed medical accuracy of this and I assume that he was referring to serotonin. It does however show that there is a physical requirement for a period of ‘coming to terms’ with change otherwise the tyranny of transition will lead people beyond their personal tipping point. This is fascinating Ian. 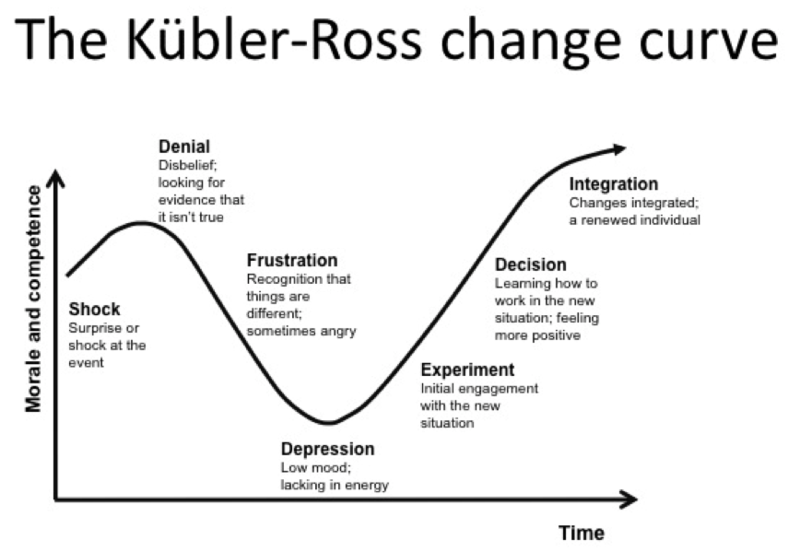 Like many others I’m sure, the Kubler-Ross curve is how we explain to managers why they may see resistance in change processes; in planning through these stages and in designing OD interventions. The one constant, in my experience, is the reluctance to let go of the past, i.e. “the last change that was made was x so why are we changing again?” “it was hard to change last time and now you’re making us change again!”. Your article therefore resonates with me also. We tend to deal with this by either mapping out stakeholder management (focussing our effort on greatest resistance / greatest influence on the outcome) but occasionally, we also take away anything that would allow someone to fall back into the past (e.g. introducing mobile and flexible working by removing all filing cabinets so that all documents must be scanned or moving all staff into a hot desking environment without recognising the emotional impact that will have if carried out without some form of OD intervention). Along with Carole’s comment, food for thought! Great post Ian! With the raising number and frequencies of changes we are thrown in across all the aspects of our lives, there is hardly a moment for someone to be in perfect ‘closure’ when we are meeting them for yet another organisational change. I absolutely agree with you on the value of individual interviews (as well as focus groups – for larger organisations). Interviewing people on their experiences and perspectives on the coming change provides invaluable information not only about the overall organisational capabilities and readiness to change but also importantly what are the possible patterns of responses and, correspondingly, what kind of interventions would be most appropriate for particular groups of people. Planning interventions without this knowledge has as little sense as working out a medical treatment for patients based on the average temperature across the hospital. Another aspect to take into consideration is that for each single individual the Kübler-Ross change curve will look different – extended or reduced along its two dimensions. Thus, someone will not go that deep into depression but might take longer to go into experimentation phase, while someone else might have a big amplitude of own emotional response to the change but get over all the phases much faster. Many factors underlie such differences – from physical mentioned by @Carole and psychological (personality), through situational (if the change just added to the ‘when it rains it pours’ in someone’s life) and cognitive (the mental appraisal the person is giving to the change). It is the last factor – cognitive appraisal – that we as OD professionals can and should leverage to help individuals and the entire organisation to master the change. Research shows that cognitive appraisal of the situation – no matter how emotionally charged it is – accounts for up to 50% of our response to it. Thank you for sharing this book and thinking. I suggest that another way we see this played out is in individual career histories. 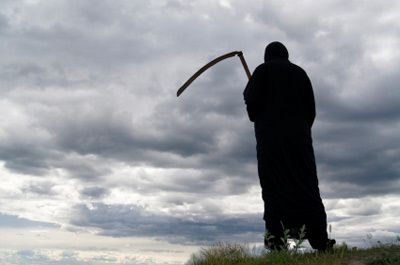 How many people are still grieving former work situations…and never let that environment/team/time go. How does this impact their current org or their own growth in the workplace? I enjoyed reading these reflections and would like to add a couple of thoughts. The term ‘transition’ is very useful , especially in career terms, but not necessarily in the Kubler Ross sense. Even without grief per se people still need to prepare for a change, experience it and deal with whatever comes up later (eg on leaving an organisation or moving into a new role). They need to understand both what they need to do but also how they are feeling. Maybe we are too wedded, as you say, to one model here not only in terms of ‘closure’ but also in what the other stages of change feel like. My second comment relates to rather discontinuous change such as that experienced in a merger or take over. In studying these experiences in Roffey research (with Linda Holbeche and Valerie Garrow) we found that people are going through a kind of transition curve but not all at the same time. So for example, very senior people experience their periods of anxiety and anger very early in a merger. Its full effects may not reach the rest of the workforce for many months or sometimes even years (when their site eventually closes). This is like swimming in a choppy sea and you need to understand who is experiencing what concerns, changes and emotions at any given time. This is why executives who proudly announce the second wave of startegy six months in are so loathed. Most staff still don’t know at that point whether they have a job or not in the new structure. Some glossy revised business strategy is the last thing they want at that point. Many thanks Ian for your post which has provided an opportunity to comment on this touchy subject especially as it was practiced in our work environment. To my recollection, the transitions were generally methodically conducted when it came to addressing the various change dimensions described in the Kubler -Ross model. The general perception was that the changes were too frequent which led to the idea that the organization did not really understand what it wanted to achieve or where it was going. Of course this could merely have been a communication deficit. What still leaves a sour taste in the mouth however is the “Tyranny” as you put it. Some of those who were going to be seriously impacted by the changes were often in the dark for too long and inconsiderately left alone to figure out the implications for their future career whether in or out of the organization. This very lengthy period of uncertainty was psychologically taxing and led to anomalies in behavior which a commentator described in one case as requiring medical treatment. This phase of the transition process was not well handled. I believe that an enhanced transparent engagement at the team level could have helped. In my current Consulting firm, we have identified this “uncertainty gap” and given advice to clients on how to address it. The feedback thankfully is that that there have been significantly improved results in reducing the dissatisfaction level towards transitions using defined parameters. Thanks Ian for getting a focused discussion on frequent transition which becomes a tyranny and sometimes a failure or ripple depression effects during phases of transitions. As per my exposure and learning during the transition phases is that the transition leaders draft a change very well at strategic level but lack highly in drafting drill down execution plan. Transitions executors need to selected from each of organisations department, execution change plan needs to drafted with some pre-approvals of actions in certain resistance scenarios so as the executors can adopt fast selection of alternate paths of execution. Majorly these executors wait for leadership to guide and approve any alternate plan of action and the time lag for approvals leads resistance to aggravate. For a better change transitions, transformations & integration each functional area or department change executors should have pre-planned and pre-approved alternate methodology of adoption of action plan so as fast execution can happen with positive outcome much before a resistance carves in. Once the people see positive outcome to them, they adopt the change before thinking of self resistance built up. And they always find a methodological approach ready for execution and further replication. Loop around feedback from transition executor to decisive leadership also needs to much faster so as any required strategic decision may be taken with immediate effects. Since I first encountered K-R, I’ve suspected its application within organisation change to be dubious and slightly self-serving rhetoric. It’s not false, and it’s not entirely without value as an explanatory device among change agents for the behaviours our interventions cause. But by choosing a psychological account of those behaviours as explanatory, we fundamentally evade the awkward possibility that people resist for rational, well-informed and legitimate reasons. What if they have sufficient grasp of the facts to *know* that the change we’re putting them through is irrelevant deckchair-rearrangement, of value only to leaders who need to prove their own political potency (and who will at some stage declare victory and move on, whatever the facts on the ground)? Well, we can’t work with that. The leader has made a case. It’s our job to follow through, so we need to choose a perspective that allows us to do the necessary bulldozing and sleep soundly. If I walk in a rational person’s shoes through the steps of the change curve, thinking instead about how people resign themselves to acquiesce to injustices they are powerless to influence, I find the same behaviours, but flowing from a different root cause, or from a different level of the causal layer cake. This insight does not lead to hugely different implications for managing change, but it does enhance empathy! So, you know, to Carole’s point, yes, we *can* talk about serotonin levels in the brain. But do we want to engage with our colleagues as human bodies or as human beings? Nice post. The analogy between grieving loved ones and having trouble leaving behind auld ways of working is tempting. Yet, I think it can be misleading. For anyone having lost close ones, there is a state of unpreparedness that will take you by storm. There and then, or later, it will. On the other hand, changes in an organisation will come and go. It is true that the pace of change is becoming neck-breaking, but many changes are not as defined or as definite as losing someone close. How many times have we not seen a top-down transformation coming the way of an organisation, for it to fail – without any need to grieve anything – because the disconnect between what the management expects its organisation to embark on and what people can really deliver have never been closely matched. In these cases, assisting organisation to cross the valley of despair is like some palliative care administered to the patient. Another approach to change, which begs for a bit more time to get started, is to ask people what their level of ambition can be for something that is demonstrably not operating well. The art of getting this demonstration overwhelming is hard to encapsulate, and is key to force people to commit to change. Then, things get (slightly) simpler in as much as people appropriate the change and become owners of its implementation. I have seen that model working wonders, especially in decentralised organisations where you need to let responsibilities to local people. Sadly, the richer mobilisation it gives you is often a luxury as horses are often bolted before OD interventions are even thought about. Over the years of doing Client Centred Consulting I often despair of the difficulty people at all levels in organisations have, in grasping the importance of dealing with people’s feelings and emotions, and the struggle they often have recognising that using the accepting style can actually be useful. Often people get as far as recognising that acceptant can be useful in helping people to deal with their feelings before moving on to problem solving where logic and analysis can be used. It is no wonder than that people are still dealing with the anger and resentment created by the last initiative when the next one comes over the horizen. Your article reminds us that we need to use acceptant style at every stage of the change process. As we work with individuals and groups helping them through the decisions they need to make, individually and collectively, as they adapt to the new situation, we need to be constantly sensitive to the emotions that are lurking just under the surface. The final part of the consulting process is disengaging or celebrating success. Maybe I have been guilty of underestimating the importance of this part of the process. I was struck by Carole Grimwood’s account of the decision by an organisation who were closing one of their sites. They decided to hold a “wake” where people could reflect collectively and share stories about the work place they were about to lose. The lesson in this for me is how important it is to help people deal with all the emotions that they have as they move towards the end of a change project. If people are to be emotionally prepared for the next initiative maybe they need an opportunity to not only to celebrate but to express any left-over regret about what has been lost as well as gained.